“Halloween,” “The Old man and the Gun” and “Goosebumps 2” For more information on other releases this week, see the Weekly Guide to Home Video Releases. 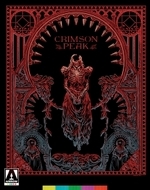 “Crimson Peak (Limited Edition)” (2015): From the imagination of Oscar-winning director Guillermo del Toro comes this lavish, stunningly realized journey into the dark heart of Gothic romance. Beginning in Buffalo, New York, during the 1880s, “Crimson Peak” stars Mia Wasikowska as Edith Cushing, an aspiring writer who is haunted by the death of her mother. Edith’s falls in love with seductive stranger Thomas Sharpe (Tom Hiddleston), who whisks her off to Allerdale Hall, his baronial, yet dilapidated English mansion built upon a mountain of blood-red clay. Here Edith meets Lucille (Jessica Chastain), Thomas’s sister who at times seems hostile and jealous. As Edith struggles to feel at home in the imposing residence, she gradually uncovers a horrendous family secret and encounters supernatural forces that will help her discover the terrible truth behind Crimson Peak. Boasting incredibly intricate and ornate production design and a rich visual style, del Toro’s film is a grandiose, boldly baroque triumph of Gothic decadence, which expertly combines and contrasts the sublimely beautiful with the shockingly grotesque. On Blu-ray, loaded with tons of extras and a limited edition 80-page, hard-bound book featuring new writing by David Jenkins and Simon Abrams, an archival interview with Guillermo del Toro, and original conceptual design illustrations by artists Guy Davis and Oscar Chichoni. 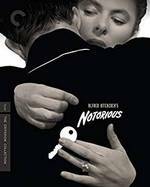 From Arrow Video/MVD Entertainment … “Notorious” (1946): With this twisting love story, Alfred Hitchcock summoned darker shades of suspense and passion by casting two of Hollywood’s most beloved stars starkly against type. Ingrid Bergman stars as Alicia, an alluring woman of ill repute recruited by Devlin (Cary Grant), a suave but mysterious intelligence agent, to spy for the U.S. Only after she has fallen for Devlin does she learn that her mission is to seduce a Nazi industrialist (Claude Rains) hiding out in South America. Coupling inventive cinematography with brilliantly subtle turns from his mesmerizing leads, Hitchcock orchestrates an anguished romance shot through with deception and moral ambiguity. A thriller of rare perfection, “Notorious” represents a pinnacle in both its director’s legendary career and the pantheon of classic Hollywood cinema. 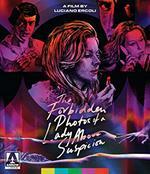 On DVD, Blu-ray Disc with new 4K digital restoration, with uncompressed monaural soundtrack on the Blu-ray, from The Criterion Collection … “The Forbidden Photos of a Lady Above Suspicion” (1970 — Italy): Before the influence of Dario Argento’s “The Bird with the Crystal Plumage” permeated every corner of the giallo genre, another strain of these distinctive Italian thrillers enjoyed considerable success. These “melodrama gialli”, heavily inspired by Clouzot’s “Les diaboliques,” relied less on graphic violence and high body counts and more on psychological tension. Minou (Dagmar Lassander) leads a pampered but dull life with her frequently absent husband, Peter (Pier Paolo Capponi). One night, while out walking on the beachfront, Minou is accosted by a mysterious blackmailer (Simón Andreu) who informs her that Peter is a murderer. Driven by misplaced loyalty to her husband, Minou gives in to the blackmailer’s every perverted whim in exchange for his silence. But as the blackmailer ups the ante, demanding that she submit to his increasingly obscene demands, can Minou hold on to what little remains of her sanity? Written by the prolific Ernesto Gastaldi (“Torso”), infused with a seductive score by the great Ennio Morricone and featuring a memorable turn by Nieves Navarro a.k.a. Susan Scott in the role of Minou’s best friend, “The Forbidden Photos of a Lady Above Suspicion” is a trippy giallo delight that brings together the talents of many of the genre’s leading lights on both sides of the camera. On Blu-ray from Arrow Video/MVD Entertainment. “The Bookshop” (2017), starring Emily Mortimer, Bill Nighy, Hunter Tremayne and Patricia Clarkson, takes place in England, 1959. Free-spirited widow Florence Green (Mortimer) risks everything to open a bookshop in a conservative East Anglian coastal town. While bringing about a surprising cultural awakening through works by Ray Bradbury and Vladimir Nabokov, she earns the polite but ruthless opposition of a local grand dame (Clarkson) and the support and affection of a reclusive book loving widower (Nighy). As Florence’s obstacles amass and bear suspicious signs of a local power struggle, she is forced to ask: is there a place for a bookshop in a town that may not want one? Based on Penelope Fitzgerald’s acclaimed novel. From Universal … In “The Dark” (2018 — Austria), starring Nadia Alexander, Toby Nichols and Karl Markovics, an undead teenage girl befriends a blind boy that she meets in a forest she haunts and hunts in. Both have been victims of unimaginable abuse, and each finds solace in the other. On the outskirts of a small town lies Devil’s Den, a mysterious tract of woods where many have entered but no one has ever left. The local legend is that the spirit of a girl who was horrifically murdered there haunts this dense forest, brutally slaying anyone who dares to step into her terrain. When a young man with a dark past crosses her path, a series of events are set in motion that may lead to redemption for two tragically tortured souls. From Dark Sky Films … “After Darkness” (2018), starring John Patrick Amedori, Valorie Curry, Natalia Dyer, Kyra Sedgwick and Tim Daly, is a Sci-fi thriller about a family’s fight to survive a solar disaster. As skies darken and hopes grow dim, the Beatys try to stay sane in a lavish home with every possible comfort … except sunshine. Raymond plans to have his family transported to a secure underground bunker. But as he makes a gruesome discovery, the greatest threat to the Beatys’ survival may be near — or inside — their home. From Lionsgate … In “8 Minutes Ahead” (2019), starring Theresa Wong and Tseng Chang, a successful Vancouver businessman returns home when he finds out his father is dying. Instead of making peace with him, he finds out that he has a half-brother and that his father has made a sudden change to his will. Now he must decide what he values most — money or family and what he is willing to do, to protect his money. 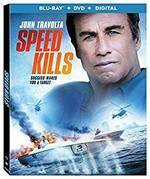 From IndiCan Pictures … In “Speed Kills” (2018), starring John Travolta, Katheryn Winnick, Jennifer Esposito, Michael Weston and Jordi Molla, Ben Aronoff (Travolta) is a speedboat racing champion and multimillionaire living the American Dream. But Ben hides a dangerous secret life: His boats are being used to move cocaine through Miami. Suddenly caught in a crossfire between DEA agents and the mob, Ben makes a desperate stand to save his family and his empire in this action-thriller based on an incredible true story. On DVD, Blu-ray, from Lionsgate … In the sci-fi-tinged drama “Jonathan” (2018), starring Ansel Elgort, Suki Waterhouse, Patricia Clarkson and Matthew Bomer, Elgort plays two brothers living very separate lives — inside the same body. Previously content to live life in shifts with one another — and communicate only via daily video sessions to recount the day’s activities — their delicate balance is ruined when they become emotionally involved with the same woman (Waterhouse). On DVD, Blu-ray from Well Go USA … There’s three fine Blu-ray debuts this week from Shout Factory/Scream Factory: “Howling III” (1987), starring Barry Otto, William Yang and Imogen Annesley. The third entry in the popular werewolf horror franchise. The race is on as a colony of marsupial werewolves attempts to outwit and outlast their human counterparts. Long ago, the now-extinct marsupial wolf (a.k.a. Tasmanian Tiger) roamed the Australian Outback. Today, a werewolf colony that has descended from these marsupials has taken over the land. This race of human-like creatures roams the outback, feeding its need. The race for survival is on as the humans struggle to contain these out of control creatures. New digital transfer sponsored by the National Film and Sound Archive of Australia … “Obsession” (1976): A 10th wedding anniversary celebration ends tragically when Michael Courtland (Cliff Robertson) discovers that his wife (Geneviève Bujold) and 9-year-old daughter have been kidnapped. When an attempt to thwart the captors goes awry, Courtland’s wife and daughter are never recovered. Several years later while vacationing in Florence, Courtland falls in love with a young woman who is an exact double of his dead wife. On the eve of their wedding, the woman disappears and Courtland finds a ransom note … a duplicate of the one found several years earlier. A riveting Hitchcockian mystery thriller from Brian De Palma … “The Plague of the Zombies” (1966), starring André Morell, Diane Clark and John Carson. In a remote 19th-century Cornish village, an evil presence lurks within the darkness of the witching hour. A mysterious plague relentlessly consumes lives at an unstoppable rate. Unable to find the cause, Dr. Peter Tompson enlists the help of his mentor, Sir James Forbes. Desperate to find an antidote, they instead find inexplicable horror: empty coffins with the diseased corpses missing! Following a series of strange and frightening clues, they discover a deserted mine where they discover a world of black magic and a doomed legion of flesh-eating slaves … the walking dead. (2011 — Denmark), starring Mikael Birkkjær, Stine Stengade, David Dencik, Luan Jaha, Ariadna Gil and Lourdes Faberes. 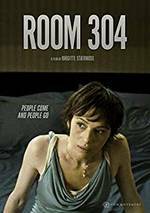 A hotel manager peers into the abyss of his empty life, leading to devastating consequences for himself, his wife and his mistress. A Spanish stewardess reaches out for intimacy and finds it in a most unexpected way. A reserved concierge is forced out of his shell by a shocking event, and an Albanian refugee gets a chance to avenge his wife, but ends up discovering something surprising instead. An Official Selection in Competition at the Karlovy Vary International Film Festival. From Film Movement … “Hippocrates: Diary of a French Doctor” (2014 — France), starring Vincent Lacoste and Reda Kateb, is a darkly comic portrait of a Paris hospital as seen through the eyes of a young intern, Benjamin, who begins his internship at the hospital ward run by his father. Confident and determined to be a success, Vincent soon realizes that the reality of practicing medicine is a lot grimmer than what he had imagined. Vincent finds himself overshadowed by a more talented intern Abdel, who is disadvantaged by his status as an immigrant. When Vincent makes a critical error, his father quickly covers it up, but Abdel is not fooled. Directed by Thomas Lilti, a former medical doctor. From Icarus Films. “Oddsockeaters” (2016 — Czech Republic) is a Dove-approved animated tale. Ever wonder where your missing socks go? The Oddsockeaters eat them! (though, to be fair, their mantra is “never take the full pair”). 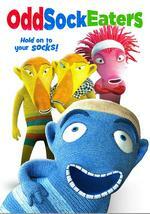 Based on the international bestselling books by Pavel Srut, “Oddsockeaters” brings home audiences into the little known world of these mischievous creatures unknown to humans. In a whimsical, heartwarming and unique adventure perfect for family viewing, Hugo is a small Oddsockeater venturing out into the big world for the first time. After moving in with his uncle “Big Boss” and his two nutty cousins, he encounters the Professor, a human determined to proving the existence of Oddsockeaters, as well as The Blades, a crosstown gang of rival sock thieves. Wild adventures ensue as Hugo learns the ropes of being an Oddsockeater as well as valuable lessons about family, love and the true meaning of loyalty. From Omnibus Entertainment … “Garfield: 20 Stories” (2019) features new adventures from the classic Saturday morning animated program, “Garfield.” Fans of the furry feline will follow along on a journey of fairy tales, history lessons, crime solving and more, including a tour of a movie museum to learn about famous cats in films in “Films and Felines,” and the real story of the Pied Piper, who happened to have a cat, in “The Pie-Eyed Piper.” From Public Media Distribution. “The Lost Village” (2018)is a devastating expose of how Greenwich Village, the epicenter of the counterculture in the 1960s and ’70s, is being turned into a wasteland of chain stores, banks and multi-million dollar condos. This award-winning documentary follows filmmaker Roger Paradiso on a journey through today’s Village as he tries to figure out how this “gentrification on steroids” got started. Talking to journalists, activists, shop-owners, professors and more, he uncovers how the landlords, politicians and NYU turned the Village into a place that is losing its heart and soul. From First Run Features … What happens when four legends of British stage and screen get together? Dame Maggie Smith, Dame Judi Dench, Dame Eileen Atkins and Dame Joan Plowright are among the most celebrated actresses of our time, with scores of iconic performances, decades of wisdom, and innumerable Oscars, Tonys, Emmys and BAFTAs between them. They are also longtime friends who here, in “Tea With the Dames” (2018), invite you to join them for a weekend in the country as they catch up with one another, reminisce, and share their candid, delightfully irreverent thoughts on everything from art to aging to love to a life lived in the spotlight. From IFC Films.